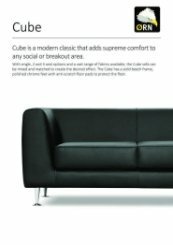 Cube is a modern classic that adds supreme comfort to any social or breakout area. With single, 2 and 3 seat options and a vast range of fabrics available, the Cube sofa can be mixed and matched to create the desired effect. The Cube has a solid beech frame, polished chrome feet with anti-scratch floor pads to protect the floor.